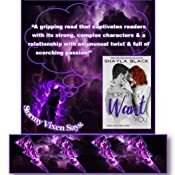 Shayla Black is a fabulous writer but sometimes i feel she takes things too far... not in this instance... she has started this series with a bang. Her complex characters are so riveting, I was hooked. The story centres around the main characters Maxon and Keeley. However there are a cast of intertwining characters that add layers including Griff's ex-girlfriend who works with Maxon and Rob also works with Maxon but he is driven by success and is cutthroat about it. ‘More Than Want You’ takes you on an emotional journey of what happens to a family when competition is prized above everything. Maxon is everything that he is billed to be. I have to say that I didn't care for him too much in the beginning. His main goal is to be number one and he pretends to not care how he gets there But there is more to Maxon and he has to find his own road. I loved Keeley from the very beginning. I loved her sunny personality and that her main goal was to be happy. Maxon and Giff's father drives these brothers apart. Keeley is the exact opposite of Maxon but somehow they fit perfectly together. This series started strong and now I look forward to Griff's story. Maxon is major douche & has had a falling out with his brother Grif. They both vie to list a vast pty belonging to an estate. He knows his brother is easily distracted by women, so he seeks the help of Keely. From the start you could feel their connection. However does Maxons revenge have the power over his heart? So his journey begins. You can't help but like Keely & the effect she has over him. You are also introduced to some other characters who will no doubt appear in future books. Be warned their is a slight twist near the end. One I never saw coming. The first book in the More Than Words series is a gripping read that captivates readers. Mason and Keeley are two strong, dynamic characters that easily grab readers’ attentions and their romance is sweet at times and full of sizzling magnetic chemistry. Maxon and Keeley are lovable, complex characters and their relationship is full of scorching hot passion that heats up the pages but it is also a bit complex as it features an unusual twist with the male having an agenda that he is consumed by, one that is completely blocking his heart which keeps the emotional turmoil high throughout this story. The plot is steady paced and flows smoothly from beginning to end and the story is intriguing holding readers captive throughout as they wonder whether this couple will ever reach a happily ever after. With a couple of surprising twists that readers won’t see coming and character stubbornness ruling this relationship, this romance is quite an enjoyable read and since the author once again spins a wonderful tale full of fascinating characters and complex character interactions, readers can easily become caught up in the story. This romance is a standalone story but readers will definitely want to come back for more than the words of this series. "I can't be with someone who wants revenge more than they want me." FINAL DECISION: If you allow yourself to get over Maxon being a major jerk, this book is a wonderful journey for his character. He learns what is really important in his life. His relationship with Keeley is rough and imperfect and finally wonderful. THE STORY: Maxon Reed is a man on a mission -- to get a deal from his estranged brother. Maxon is willing to do just about anything -- including finding a woman to distract his brother. When Maxon meets Keeley Kent and there is an instant attraction between them and he knows that she is perfect for his plan. After convincing the reluctant Keeley to give his plan a change, Maxon spends weeks tutoring Keeley in exactly how to appeal to his brother. The problem is that every moment they spend together brings Maxon closer to realizing that Keeley is perfect for him. But will Maxon give up his plan of revenge in order to get the girl himself? OPINION: I don't mind heroes who are jerks in the beginning of a romance book as long as they don't end up that way. Maxon is a world class jerk (though his brother has him beat). Intensely competitive with his estranged brother, Maxon clearly has no morals about using people (despite his belief that he does). His competition with his brother is primary -- before friends, before love, before anything and everything. The good news is that this book just throws Maxon's world into disarray. It never goes where he plans. And he ends the book a better person who is capable of love. Keeley is almost the opposite of Maxon. Altruistic, emotional, willing to help and do anything for those she cares about. I like how she operates as Maxon's guide and conscience in many ways. While we get a bit from her point of view, the book is really about Maxon's journey (because he is the one who really needs the help). Keeley is more of a free spirit than the career driven Maxon, but she is also happier. The relationship between Maxon and Keeley is complicated by Maxon's own inability to understand what he wants and needs and how to get there. I enjoyed seeing Maxon breaking down. He has a nasty background which doesn't excuse his behavior but makes it more understandable. The focus in this book is really on Maxon getting himself right and how his relationship with Keeley is the catalyst for that. I enjoyed this book more as I got into it (Maxon was hard to like at first). By the end of the book, however, I can't wait to read the next book in the series. WORTH MENTIONING: This book also introduces the romance that is the subject of the second book in the series. CONNECTED BOOKS: MORE THAN WANT YOU is the first book in the More Than Words series. OMG i loved loved loved this book. I had planned on not reading this book, because i tried an other book in a series similar to this series and I really wasn't impressed with it, but I am so glad that I did read this book, because I just love Maxon Reed and Keeley Kent. The chemistry between these two just jump off the pages at you and will NOT let you go..........Maxon had a horrible childhood and has lived his life fighting with family only to realize that his father was an evil evil man..... enter Keeley she's a transplant from the states to Maui, courteous of her ex boyfriend. She meets Maxon and they find out that they have this awesome chemistry but Maxon has an agenda and will not stop for nothing. While reading this book, you will laugh, you will get pissed off and then you will cry, cause Maxon just breaks your heart when he realizes that he has a lot to lose. 5.0 out of 5 starsIf I could give this book MORE than 5 stars I would!